Brands need to better communicate the environmental benefits of flexible packaging to consumers, according to the Flexible Packaging Association (FPA). FPA has published an infographic to illustrate this. The infographic summarizes the new FPA sustainability report, ‘Perspectives on the Meaning of Sustainability in Flexible Packaging’. 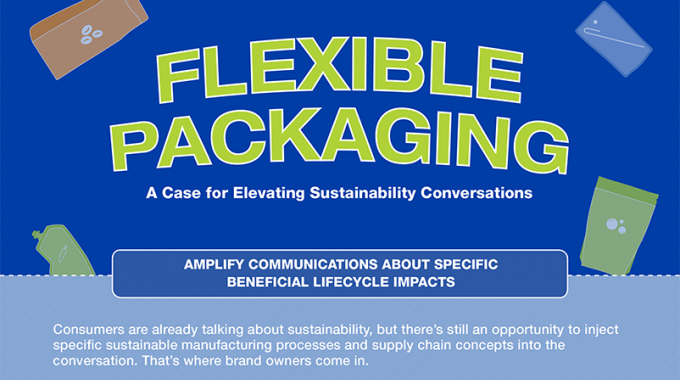 The report explores how flexible packaging lends itself to brand owners’ ability to establish a reputation for environmental stewardship. FPA conducted a sustainability study in 2018 to better understand perspectives on sustainability and packaging among both consumers and brand owners. The study integrates insights from brand owners surveyed online in June 2018 by Packaging World and insights from an online survey of US consumers conducted by The Harris Poll in July 2018. Although consumers are most likely to associate sustainability with familiar terms like ‘renewable’ (59 percent) and ‘recyclable’ (56 percent), some recognize the importance of business-to-business terms like ‘transportation efficiency’ (24 percent) and ‘circular economy’ (13 percent) when presented with them. Twenty-four percent of consumers say transportation efficiency describes sustainability, while 81 percent think it’s at least somewhat important that product packaging has been transported efficiently. The beneficial lifecycle impacts and sustainability advantages of flexible packaging are more likely to resonate with consumer ages 18-44, who represent the next wave of buying power in the US, FPA noted. Brand owners who promote these messages can take advantage of the opportunity. The association stated study findings that younger generations are more likely than members of older generations to believe flexible packaging is sustainable, and are less likely than older generations to think glass or corrugated are sustainable. Millennial consumers ages 18-34 are more likely than older consumers to say they support/buy from businesses with sustainability initiatives. FPA went on to note that brand owners in general are in tune with consumers’ viewpoints of sustainability, yet disagree on their understanding of the concept. This skepticism on behalf of brand owners suggests an opportunity to inform consumers on the complete picture of sustainability. Figures show that 83 percent of consumers say they understand the meaning of sustainability, but only 60 percent of brand owners think consumers understand the meaning of sustainability.